GETDP: A lady wearing Brazilian hair of 300k & complaining of headache. Does she need a prophet 2tell her dat she's carryin 2 plots of land on her head? A lady wearing Brazilian hair of 300k & complaining of headache. Does she need a prophet 2tell her dat she's carryin 2 plots of land on her head? 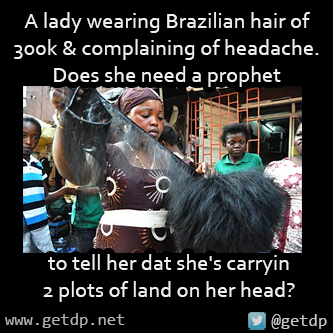 a prophet 2tell her dat she's carrying 2 plots of land on her head?